Many of the Windows 7 test builds include a Send Feedback link on the top of each open window. While I'm an advocate of sending Microsoft feedback on beta builds I like to do it through the link on the desktop and prefer not to clutter the titlebar. Click on the start button and start up the Registry Editor by typing in regedit and hitting Enter. Once RegEdit is open, navigate through HKEY_Current_User, Control Panel and Desktop. 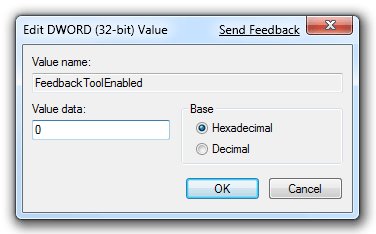 Modify FeedbackToolEnable and set the value to 0.